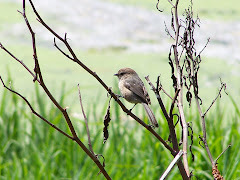 Not too long ago an Orange County Birding post brought up an identification problem occurring in Orange County and other Southern California locations. 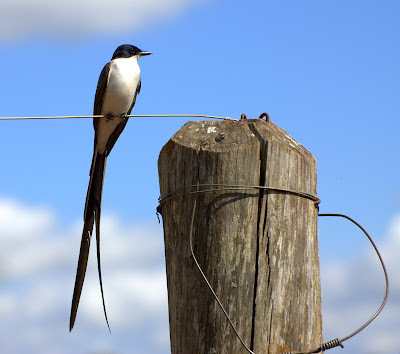 People are reporting sightings of rare long-tailed flycatchers when in fact what they are seeing is the more common introduced species the Pin-tailed Whydah. It is actually not a flycatcher at all. The reason for the error is clear. Pin-tailed Whydahs are introduced birds that are not usually listed in the field guides. If a field guide is your only reference, then you are missing a key piece of information: Orange County and Southern California have large populations of introduced species from Asia, Africa, and several other locations. So remember that not all birds you observe may be in your field guide, and some may actually be introduced species. To avoid misidentifying this species as a rare flycatcher, you will need to become very familiar with the Pin-tailed Whydah. Pin-tailed Whydahs originated in Sub-Saharan Africa, but have been kept as a common cage bird in many countries. Pin-tailed Whydahs have escaped or been released in Singapore and The United States--in particular Southern California and the United States territory of Puerto Rico. 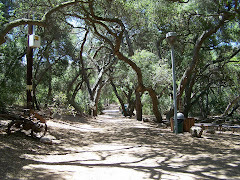 They have established significant breeding populations in Southern California. Bill--The male Pin-tailed Whydah has a strong, bulky, bright orange bill built to crack seeds. It is after all a finch. The brown, black, and white females are rather drab in comparison. 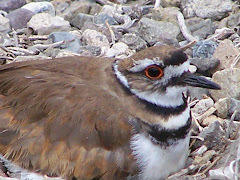 I have seen photographs that vary widely of in the color of the female's bill which I believe is due the nonbreeding male being identified as a female in some online photographs and vidoes. 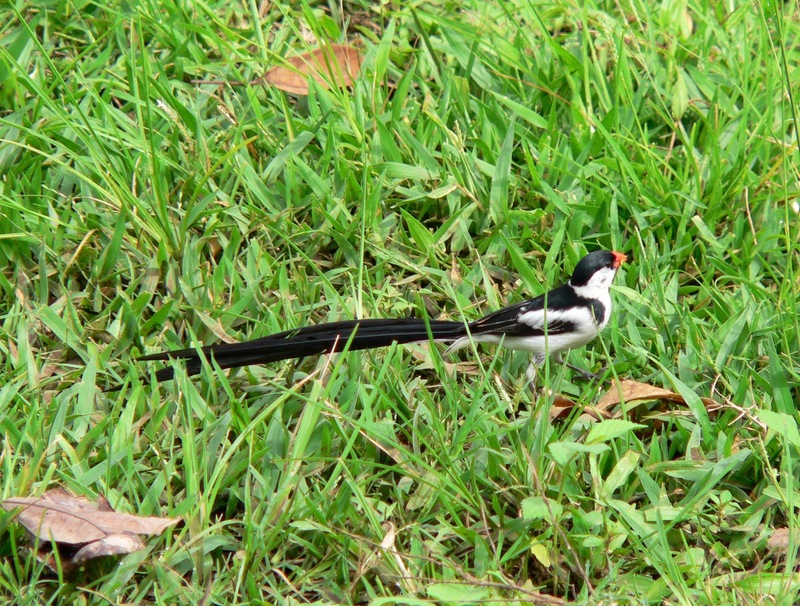 The Pin-tailed Whydah had a black cap. The black cap of the Pin-tailed Whydah does not extend into the cheek area. 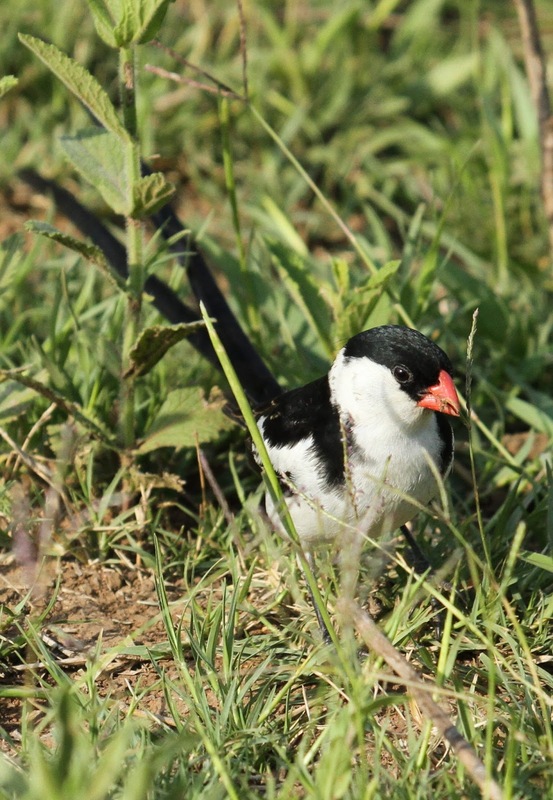 So if the cheek is white and the cap is black, you most likely have a Pin-tailed Whydah. The pin-tailed Whydah eats seeds, insects, and green plants. You will see the Pin-tailed Whydah perched or feeding on the ground or at a backyard feeder, but you will not see it fly catching. Only breeding males have a long tail. 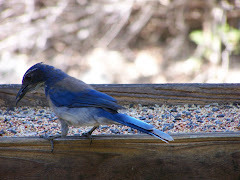 Females and non breeding males have a normal-sized finch tail. The above video by 13seaeagle on YouTube shows the male and female Whydah, courtship behavior and more. 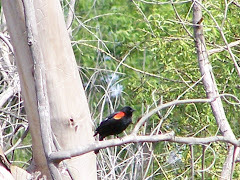 Notice the white cheek and the black cap on the male. Grasslands with bushes, trees, and water are the primary habitat. 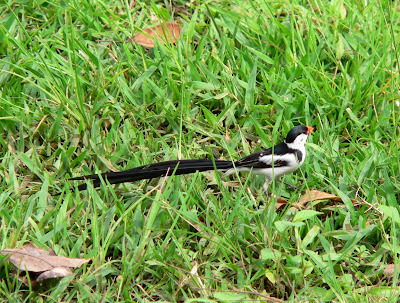 The Pin-tailed Whydah is also seen in cultivated gardens. As you might imagine regional and other parks in Orange County are perfect habitats for the Pin-tailed Whydah. Cemeteries in Orange County are also prime habitat. There have been several sightings of Pin-tailed Whydahs--some in large groups-- at several Orange County cemeteries. Pin-tailed Whydahs are regularly seen at Huntington Central Park, Craig Regional Park (first sighting in Orange County Birding was listed here in 2001), Carbon Canyon Regional Park, Mile Square Regional Park, Yorba Linda Regional Park, Santa Ana River, Harriet Wieder Regional Park (not surprising since it is connected by open land to Huntington Central Park), backyard feeders in Yorba Linda, Westminster, and many other locations. Their breeding displays are impressive. The male hovers in front of the female displaying its long tail. Quite an attention grabber. 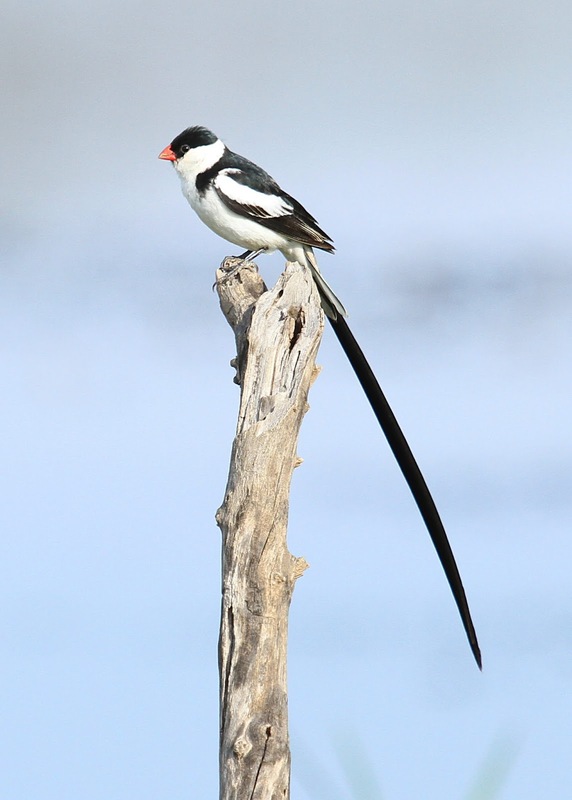 The Pin-tailed Whydah is parasitic. It usually lays its eggs in the waxbill's nest. Some believe that in Orange County it is laying its eggs in the nests of another introduced alien species the Scaly Breasted Munia aka Nutmeg Manikin aka Spice Finch. There is some concern that they may be using the nests of native birds. Both male and female Pin-tailed Whydahs breed with several mates. They do not pair up to build a nest, brood, or raise their young since they lay their eggs in in the nests of other finch species. Pin-tailed Whydahs have been reported to chase other birds away at feeders and are generally aggressive. Males are even more aggressive when it is breeding season. Since Pin-tailed Whydahs are finches, they will be seen around seed feeders, weeds and grasses laden with seeds. They are pretty much behave like other finches, but do it with a very long, black tail. Very finch-like. High pitched calls. 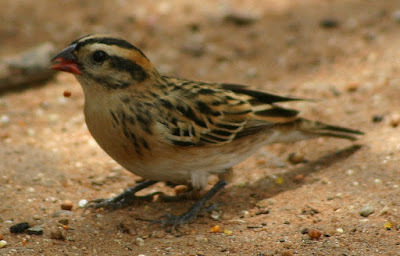 Click on the links for Xeno-Canto--Pin-tailed Whydah and for the Internet Bird Collection--Pin-tailed Whydah to listen to actual recordings. The Fork-tailed Flycatcher's bill is thin and black, and not at all not bulky or red like the Pin-tailed Whydah. And note the gray on the upper back. 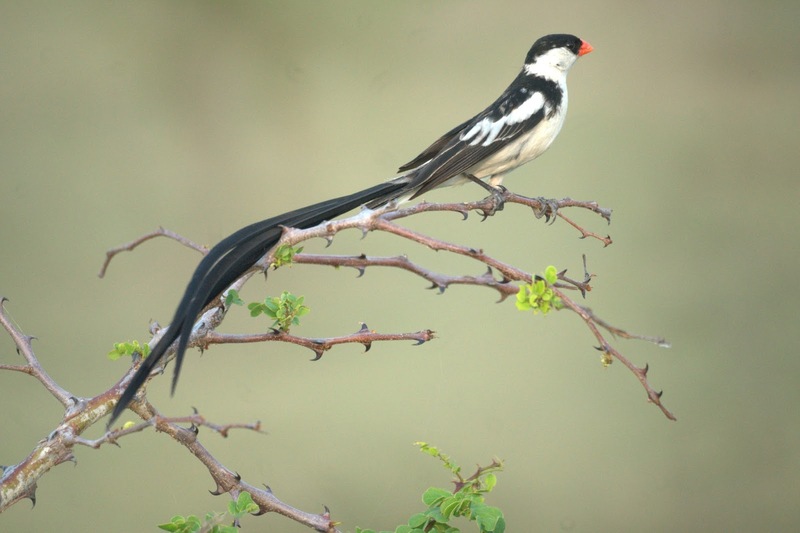 The Pin-tailed Whydah is black and white. Fork-tailed Flycatchers are wanderers from the tropics of South America and are most often seen along the Atlantic coast, not the Pacific coast. It would be amazingly rare to see one in Southern California. Video by the Pantanal Bird Club promotes tours in the Brazilian pantanal and other important areas in South America. Unlike the Fork-tailed Flycatcher Tyrannus savanna, the Scissor-tailed Flycatcher is actually a native of the United States. In fact, the Scissor-tailed Flycatcher Tyrannus forficatus is the state bird of Oklahoma, and is also seen in Texas, and nearby states. It is a native of Central America and migrates to Texas, Okalahoma, and nearby states in the summer to breed. Like the Fork-tailed Flycatcher, the Scissor-tailed Flycatcher is closely related to kingbirds being in the same genus,Tyrannus. 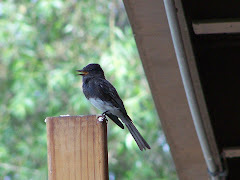 It does tend to wander a bit during spring and fall migration and pop up in unusual places. Scissor-tailed Flycatcher from the LabofOrnithology. Notice how unlike the Pin-tailed Whydah it actually is. The colors are softer. The Scissor-tailed Flycatcher has gray and salmon colors as opposed to the cleanly patterned black and white of the Pin-tailed Whydah. 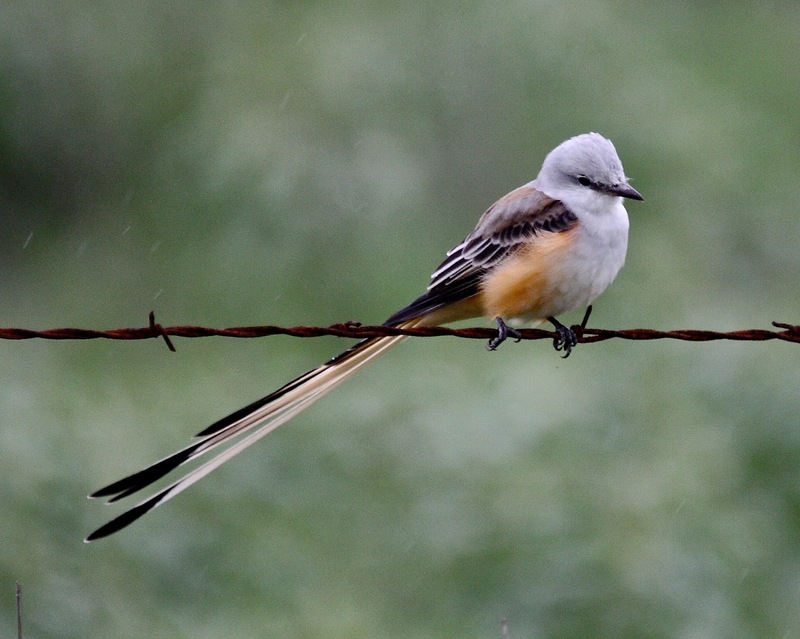 The Scissor-tailed Flycatcher's cheeks are gray, not white. 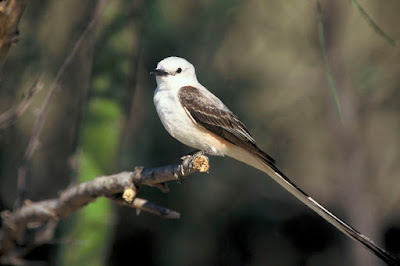 Note that Scissor-tailed Flycatcher DOES NOT have a black cap like the Pin-tailed Whydah and Scissor-tailed Flycatcher's bill is black and thin like a flycatcher rather than bulky and finch-like. The only thing they have in common with the Pin-tailed Whydah is that their tail is long. However, even in that there are differences. 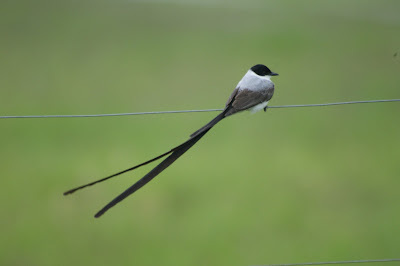 The long tail of the Scissor-tailed Flycatcher has white in its tail unlike the all-black tail of the Pin-tailed Whydah. You will see Scissor-tailed Flycatcher flying out often from low perches to catch insects like all kingbirds. They also will fly down and take insects from the ground or pick them off vegetation. Though, like kingbirds, you may see them perched near the ground, they are not eating seeds, but perched watching for insects. In winter they expand their diet to include fruit. The sound and behavior of Scissor-tailed Flycatchers will definitely make you think, kingbird. If you see a long-tailed bird that you think is rare, you must first check to eliminate the Pin-tailed Whydah. 1) What color and shape is the bill? A male Pin-tailed Whydah will have a bright orange, finch-like bill. 2) What pattern and color does it have? The Pin-tailed Whydah is cleanly marked with a black and white pattern. 3) What color is the cheek? 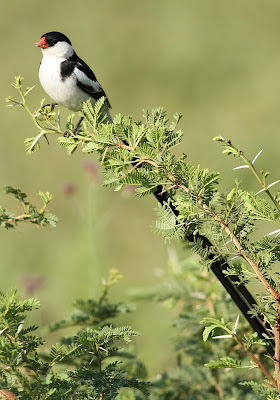 If it is white, it is most likely a Pin-tailed Whydah. 4) What kind of behavior does it exhibit? Eating seeds foraging like a finch would exclude the rarer, long-tailed birds which are both flycatchers. If it acts like a finch, it is most likely a Pin-tailed Whydah. Here is a very short video from YouTube by Nancy Balstad NMT. When you report seeing a rare long-tailed flycatcher in Orange County, keep in mind that questions and requests for documentation are not personal. It is just good birding practice For birding data to be meaningful, it must be as detailed and accurate as possible. This means questions will be asked and photographs or videos will be requested. It is not uncommon to see a Pin-tailed Whydah in Orange County, but it is very, very rare to see a Fork-tailed Flycatcher or a Scissor-tailed Flycatcher. Again, requests for documentation aren't personal. We all make mistakes. Remember, document, document, document. As they say in many professions, if it isn't documented, it didn't happen. 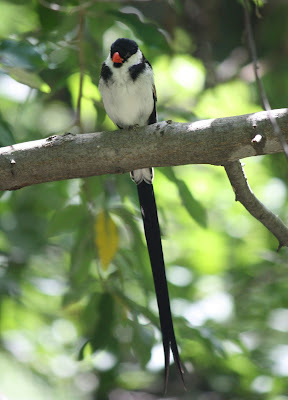 Read about a rare bird often mistaken for the more common introduced Pin-tailed Whydah. Read more about another bird mistaken for the introduced Pin-tailed Whydah. Very helpful site with pictures, videos, and sound recordings. Article from 2013 regarding the Pin-tailed Whydah.